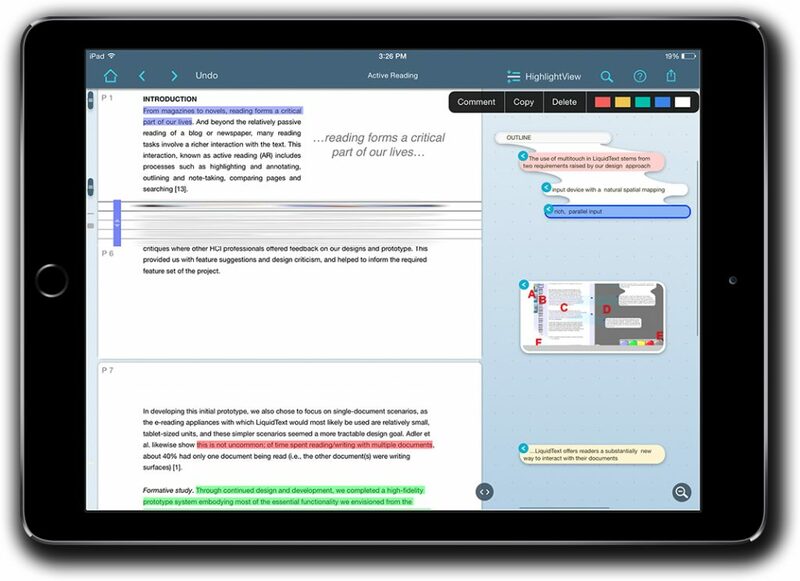 Out today is a significant enhancement to an app that may forever change how you read and annotate complex documents — at least if you use an iPad and especially if you use an iPad Pro. The app is called LiquidText and it has been available since 2015. Since coming on the market, it has won praise from many corners, including having been named by Apple as the most innovative iPad app of 2015 and by Time magazine as one of the 10 best apps for iPad Pro. Legal industry reviewers have also praised it. David Sparks at MacSparky called it a better way to review long PDF documents and Neil Squillante wrote favorably about it at TechnoLawyer Blog. Exactly what LiquidText does is better seen than explained, which is why I’ve include the video above showing the new ink feature. The basic app is free, so if you have an iPad, I urge you to install it and try it for yourself. But the essence of it is, as the name suggests, that it turns documents into a more fluid experience that lets you more effectively highlight, select, annotate and connect portions of a document (or of multiple documents with the paid version) in order to enhance your comprehension. Today’s release takes it to the next level by adding freehand inking — the ability to write anywhere within LiquidText, to connect anything just by drawing a line, and to excerpt anything just by drawing a circle around it. While this new feature is optimized for the iPad Pro and the Apple Pencil, it works on earlier iPad versions as well using any stylus. I tested a pre-release version on an iPad Air 2 and it worked well. Every document you read in LiquidText is accompanied by a workspace. This appears to the right of the document in horizontal view and below it in vertical mode. As you read, you can excerpt text by highlighting it and dragging it to this workspace. With the new ink feature, you can simply lasso the text and drag it to the workspace. Excerpts always remain linked to the spot in the document where you found them. But the workspace is fluid. You can move excerpts around or group them together simply by dragging one over another. You can add notes anywhere in the workspace, either typed or freehand. With the new ink feature, you can connect anything by drawing a line — connect a note to a spot in the text or connect notes and highlights to each other. Tap any note or excerpt to return to the source point in the document. Pinch a document to collapse it and display different sections side-by-side. A big part of the “liquidity” of LiquidText is the ability to pinch a document to compare different parts side by side. Say you’re on page 20 of a contract but there is language on page 2 you want to compare. Simply pinch the document to collapse the pages in between and show both page 20 and page 2 in the same view. Pinching can also be used to collapse a document to show all of your highlights or search results in a single view. LiquidText provides multiple options for annotating a document. Draw or highlight anywhere on the document, in your notes, or on the workspace. Add notes and comments to other notes or excerpts. LiquidText even lets you comment on two or more sections of a document at once or, with the paid version, link comments to multiple documents at once. LiquidText can be used to read any PDF, Word and PowerPoint document, and can open documents from Dropbox, iCloud Drive, Box and other sources. You can also import webpages from the built-in browser or from Safari. Projects can be exported from LiquidText as PDFs that include both the document and the workspace or as Word files that convert your notes into a linear document. Full LiquidText projects can be shared with other LiquidText users in their native format. As noted, LiquidText is free from the App store. A version that lets you view and annotate multiple documents at once costs $4.99 and can be purchased from within the app. In my opinion, LiquidText is a more intuitive way to read and mark-up documents — especially long and complex legal documents. The new ink feature makes it ideal for iPad Pro owners, but any iPad owner can use it productively with either a keyboard, a stylus or both.